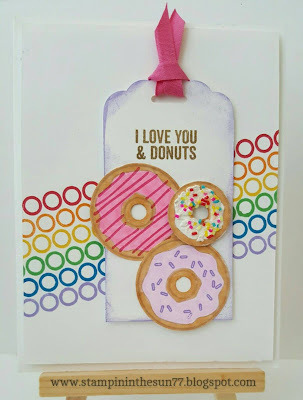 Stampin' in the Sun: Donuts for You! Good Evening! Yesterday I had some fun at my local scrapbook store that had a free Christmas in July event. 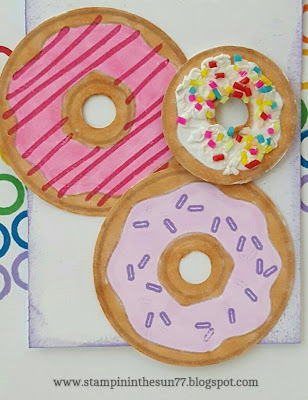 I learned 3 new techniques and had soooo much fun! Today was a day filled with lots of cleaning and organization after church! Then I decided to start printing all of the things I have downloaded over the summer. After printing enough to run out of ink (who knew there was such a little amount of ink in those ink cartridges?). 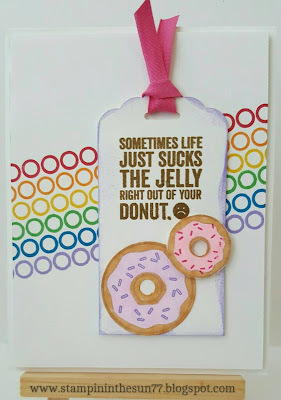 I just realized I never posted my cute donut cards for you! I created these cards for a few important people in my life. I love how they turned out! I used Stampin' Up! inks and a Simon Says Stamp Set. The stamp set is properly named "I love donuts". Wondering how I made the cute little donut look so realistic? I colored them all with Spectrum Noir markers and then added Liquid Applique. Before I heat set the liquid, I added some fun sequins I had from a shaker card kit. When heating the applique, make sure to heat from the underside - so the heat doesn't burn the "frosting". There is a new product called Tsukineko Radiant Neon AMPLIFY Puff Ink that creates a similar affect and comes in all sorts of great colors. 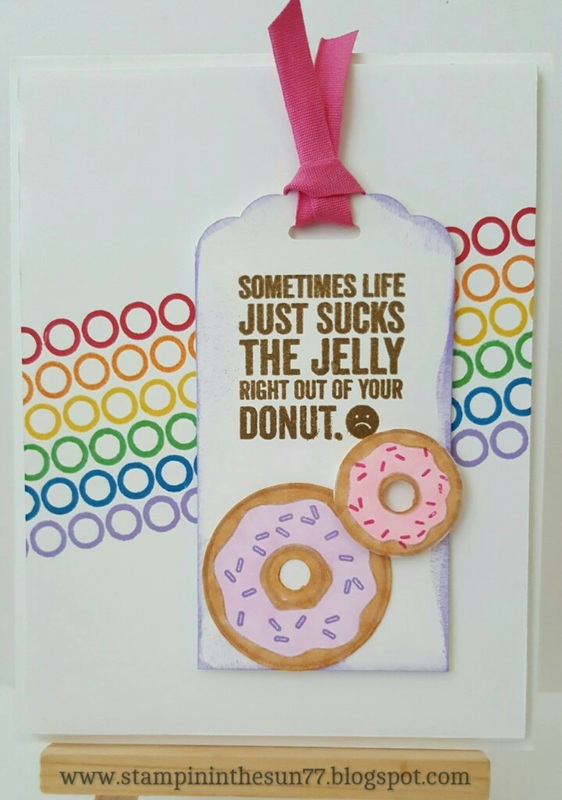 I love both sentiments and this card was sent to my chemo angel with a Dunkin' Donuts gift card! I really love the long thing stamp with rings.... it created a really cute effect. Don't forget... to celebrate my birthday this past Monday, I am offering a free INK PAD with EVERY $50 purchase you make (July 23-30th)! That is a $6.50 value for free! You can purchase online in my store (and I will mail the ink pad to you) or you can contact me to place the order! Make sure to use hostess code: PPZSGEY2 when ordering from my online store so I know who to contact for the free ink pad(s) and 5 monthly cards! Thanks for following me! 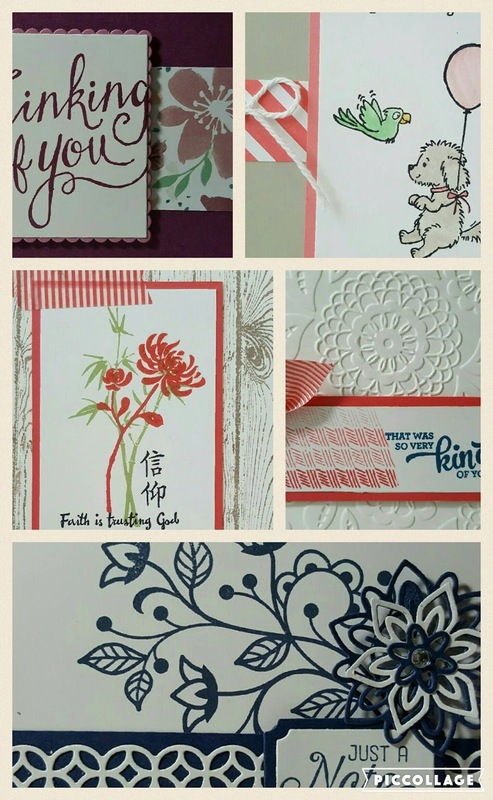 See you tomorrow for some Stampin' Up! inspiration!